Side 1 printed with 2 PMS colors using heavy coverage. 12pt C1S White Semi-Gloss stock coated with Aqueous Matte. H3 business card slits on left pocket, with H2 business card slits on right pocket. 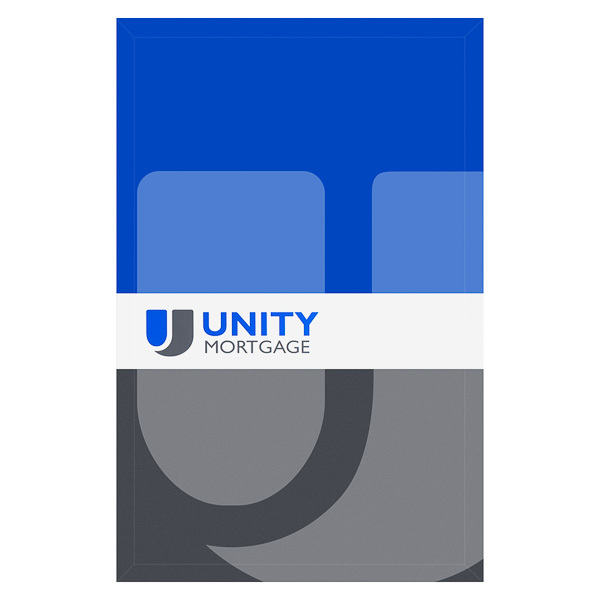 Unity Mortgage's design is all about brand identity. The corporate color palette on both covers utilizes blue to represent the mortgage service provider's professional style, while gray lends a modern touch to the design. The Unity logo is printed twice on the cover to reinforce the brand identity while also breaking up the large blocks of color on the panel. On the back, contact information is easily accessible between the blue and gray color blocks. 1 foil stamped area on Side 1 of uncoated 80lb Neenah Classic Columns Epic Black Cover stock. H1 business card slits on right pocket. 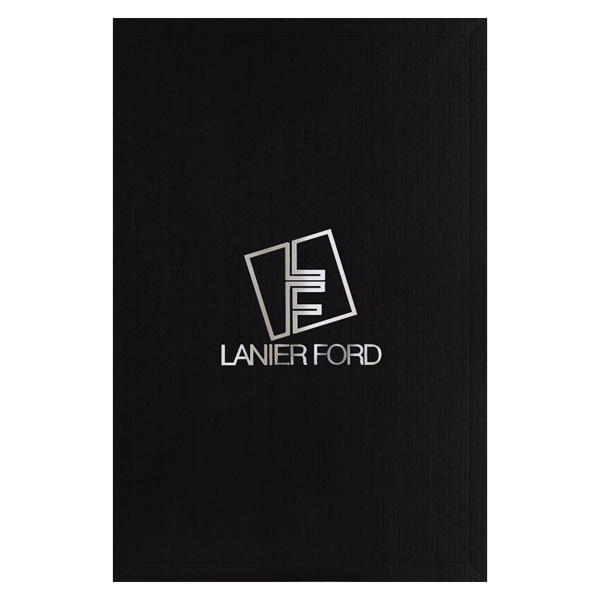 The attorneys at Lanier Ford selected a classy design worthy of a prestigious law firm. Its black stock bears a columnar texture that contrasts the smooth metallic foil stamp. The shimmery metallic platinum logo brings light and motion to the cover design. The logo itself showcases the firm's innovative personality with its vertically aligned initials inside a slightly off-kilter square and the full brand name spelled out below. Side 1 printed with 2 foil stamped areas and 1 PMS color using light coverage. 100lb Deep Black Linen stock uncoated. H1 business card slits on right pocket. Sunset Homes, an architecture company on the island of Anguilla, promotes its Tranquility Beach homes with this classic design. Black linen stock has a slightly rough feel to complement the smooth Metallic Gold foil stamp. 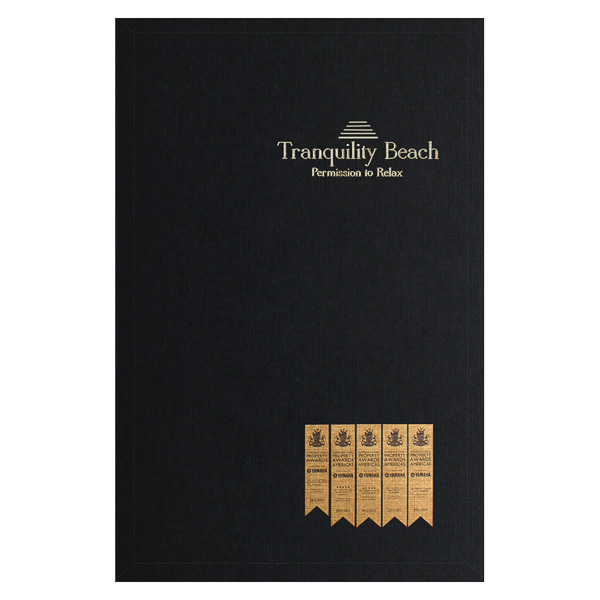 The Tranquility Beach logo and a row of ribbons allude to the firm's award-winning history. On back, the Sunset Homes logo and contact information help homebuyers connect with the parent brand. Four-color process printed on Side 1 of 16pt C1S White Semi-Gloss coated with Bio-Plus UV. H3 business card slits on the left pocket and H2 business card slits on the right pocket. 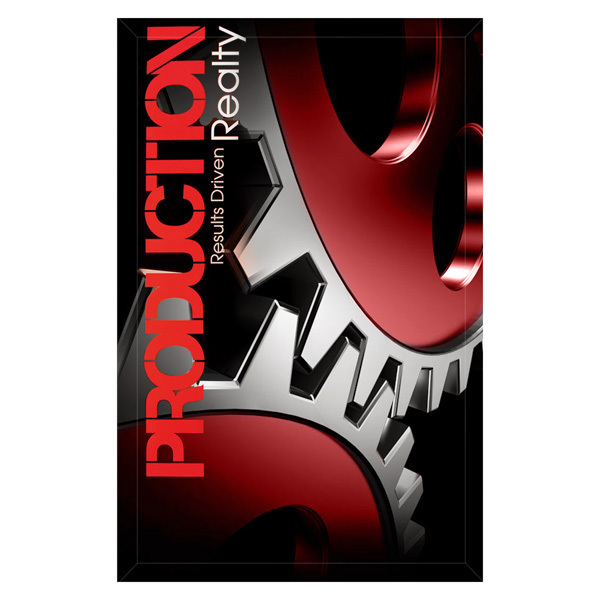 Like a well-oiled machine, Production Realty will work for its clients, as illustrated by the cogs featured on both covers and the pockets. The bold red letters evoke a sense of urgency. Contact information is on the back. Your complex legal documents deserve to be stored in one safe, easy-to-access place. Expansion scores give this product the ability to hold up to 3/4" of 8 1/2" x 14" legal documents. This can include lots of slim legal-size papers or several thicker materials, such as pamphlets, booklets, or information packets. Thanks to the Conformer® technology, the pockets and covers lay flat whether carrying a single page or an entire packet.